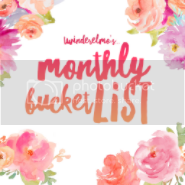 It’s been a while since I’ve done a monthly bucket list. Usually I have every intention, but I’m terribly unorganised and end up forgetting about it until it’s too late. Of course this month I’m on the ball, because it’s January and I’m a new, more organised person. HA only joking, I’m sure I’ll be late again in February. Anyway I don’t have last month to update you on, so I’ll just jump straight in to my goals for this month. Read a bed time story to the kids every night – I used to read the kids a story every night without fail. Now I often find myself sending them up to bed hastily so I can take part in an instagram instant thread, or because I have a deadline to meet. In 2017 I really want to get the work/life balance right and spend more time with my children. This month I want to set aside time before bed to cuddle up on the sofa and read with the kids each night. Read for ten minutes before bed – Staying on the subject of reading, I’d like to start making sure I make time for myself to read each night too. I’ve got in to a really bad habit of spending time scrolling through notifications on my phone as I lie in bed, and I think it’s part of the reason I have such trouble with my sleep. I’m not really giving myself mcuch time to switch off. So, I plan on reading a little bit before bed each night as it usually helps me relax. Make use of my bullet journal – I’ve been using a bullet journal for a while now. It’s nothing fancy, I tend to keep it very simple because I find it easier to use like that. I don’t use it enough though, sometimes I’ll go weeks without touching it. I do find I’m much more productive when I’ve set out daily tasks in to it, so I’d like to use it every day in January to hopefully help my have a productive month. Start our family scrapbook – When I was in England I picked up some bits to start a scrapbook. Since coming back I’ve barely had time to take it out of the bag, but as the kids go back to school and things quieten down I’d like to make a start on it. That is my goals for this month. I’ll update you on my progress next month, so please do check back. What are your goals for the month ahead? Liked this post? Why not follow me on Bloglovin so you never miss a post? I like the idea of a family scrap book! Give me book ideas for LAHP…Oh Harry I Miss thee. Well done for linking up in time, you’ve changed!